What's your family's go-to main course on the holidays? Another Turkey maybe? Prime Rib, Roast, Cornish Hens, or maybe a vegetarian option? The list is endless. In my family, my mother always tries to make something really exciting, and it is always delicious. This year it is an 18-pound brisket. In honor of my mother's fun extravagance during the holidays, I thought I would reflect and research some really delicious recipes for you all to try out during the holidays. In case you are just totally stuck on what to make this year! The strange and funny thing about getting older is how much your taste buds really do change, and what you begin to crave. For me, it's cranberry sauce put on anything and everything during the holidays- anyone else? 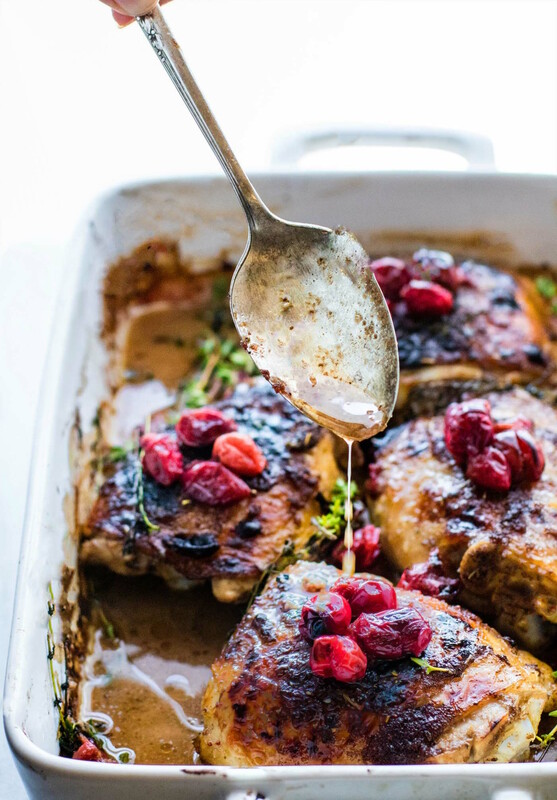 In lieu of my cravings, I came across a really exciting recipe on Pinterest for a cranberry balsamic roasted chicken.. I mean COME ON. It really doesn't get much better than that now does it? Okay, it does with dessert, but more on that later. I think for a little pre-christmas ladies night at my house I'll be making this delicious recipe. For side dishes, you can't really go wrong with carbs now can you? Anything loaded with butter and cheese is the key to my heart. if you're a potato lover like I, and most people are, but you aren't entirely sold on mashed potatoes this year, twice baked potatoes are an excellent option. The trick with twice baked potatoes is cooking the potatoes early and then letting them sit in the fridge for a few hours so they're not scolding hot when you are trying to work with them. I like to put my oven on about 400 degrees, poke holes in the potatoes with a fork, and then let them cook for about 45 minutes. Then I remove the potatoes, place them in the fridge for at least an hour, and then begin. Cut the potatoes in half long ways, scoop as much of the insides out as possible, while still maintaining the integrity and shape of the potatoes. Mix the insides in a bowl with all your favorites! I like to do butter, sour cream, cheese, garlic, and a bit of milk. Then I scoop the mixture into the hollow potatoes and place it all back in the oven for another 15-20 minutes, or until the cheese looks nice and melted. A staple in my family's holiday meals is green beans! But not just any green beans. Magical and delicious beans. Dump the entire contents of the green beans in a pot, and simmer on low. Add in bacon cut into squares, 1/4 of an onion cut into wedges, about 3 tablespoons of brown sugar, and however much seasoning you like. Let it all simmer for at least 15 minutes. Voila! The best green beans you will ever have. Always make the deviled eggs and mashed potatoes if you can! The store bought ones are seldom good, and you will be so proud of yourself when everyone is licking their fingers over these crowd favorites! Don't ever forget the rolls. They are so important, especially when warmed in the oven. Hawaiian Sweet Rolls are usually a hit. Experiment with sweet potatoes! They are super healthy for you, and different enough to be exciting. Oven roasted sweet potatoes with our Herbes de Provence are to die for! Clean as you go~ Don't leave yourself a huge pile of dishes to stress over. As you cook, clean. In smaller doses, cleaning isn't so bad. As things are cooking or cooling, clean up all the small dishes you used. You'll thank me in the end. Happy Holidays everybody. Be safe, eat lots, and don't forget what's most important to you! My daughter made this because of you suggesting it. It is the best holiday chicken I have had. Packed full of flavor, juicy and easy to make (so she stated). Thank you for all your yummy suggestions Spice Hut.